Cronyism remains unchecked in the world’s largest economy. First, because cronyism is in some ways the antithesis of capitalism. The freedom to compete and the freedom to fail that are central tenets of capitalism are severely compromised by cronyism when in the former case powerful politicians intervene to shield their friends in business and finance from competition, and in the latter intervene again to save them from bankruptcy or occasionally from criminal prosecution. Of course, these friends in turn are no disloyal slouches and they later show themselves to be supremely appreciative by underwriting, financially and otherwise, those same politicians who had all but guaranteed their continued dominance in normal times and their survival against bad odds in times of distress. Second, because cronyism is just as prevalent, or arguably more prevalent, in a socialist system than in a capitalist one. Socialism is made popular by charismatic figures appealing to the idealism of some voters but wherever it succeeds in establishing itself, its anonymous toiling bureaucrats turn out to be expert cronies of the very first order, if we are to judge by the experience of many countries in the past century. This experience suggests the following chronology of events: cronyism gradually creeps into and takes over the laissez-faire economy. After some time, its extractive practices and excesses make socialism appear desirable and reasonable to an increasing number of voters. Finally if socialists manage to take control of government, they trumpet the victory of the people and the dawn of an egalitarian era but in their actions simply replace one set of cronies with another. If this is accurate, socialism then would not be the system that replaces capitalism, but rather the culmination of cronyism. Cronyism is a disease on the body of laissez-faire and socialism is an ultimate manifestation of that disease, investing all the organs of the body and bringing about its final demise. For evidence, see Venezuela. Did the downward spiral start with the socialist Hugo Chavez? Or did it start with the cronyism that preceded Chavez and that made Chavez attractive to an increasing number of people? A case can be made for the latter, even if Chavez in the end played a key role in precipitating the downfall. The hypothesis is that when laissez-faire is compromised by cronyism, the entire social and economic architecture becomes more vulnerable to the siren call of socialism. This may be because lower income people instinctively understand and accept that a Henry Ford or a Steve Jobs would earn a large fortune as a just reward for his innovations and business genius and large contributions to the advancement of mankind. The same people also understand and accept that lesser Fords and Jobses would earn smaller fortunes that are commensurate with their own lesser contributions, and so on. But these same people have a more difficult time accepting the vast sums extracted from the economy by people who take few risks, contribute little, and owe their advancement and wealth mainly to the lottery of birth or to the connections they have made in the higher circles of learning, politics or business. To say so is not a refutation of capitalism, but of cronyism. Some industries are prone to “rent seeking”. This is the term economists use when the owners of an input of production—land, labour, machines, capital—extract more profit than they would get in a competitive market. Cartels, monopolies and lobbying are common ways to extract rents. Industries that are vulnerable often involve a lot of interaction with the state, or are licensed by it: for example telecoms, natural resources, real estate, construction and defence. (For a full list of the industries we include, see article.) Rent-seeking can involve corruption, but very often it is legal. More on this later but note in passing that the term capitalism itself has a tenuous pedigree since its use did not become widespread until the mid 19th century mainly as an antonym to socialism or communism. It has little other reason to exist and proponents of freedom in commerce may be well advised to use the term laissez-faire instead, or an English equivalent, and not let themselves be ensnared in a futile debate of one -ism against another. People who engage in a free and mutually beneficial exchange of goods and services don’t cast about looking for an -ism to describe their activity, just as breathing comes to us naturally and we are not looking to encode a complex ideology to justify its benefits. We need breathing to support life, and we need laissez-faire for the very same reason. Until about two decades ago, the problem of cronyism was mainly present in smaller economies in the developing world where the governing elite was small and dominated by local business interests. In each of these places, politicians and business leaders were closely related by class or clan or blood or marriage, and they successfully perpetuated a system that preserved their wealth and power. More recently, cronyism has been on the rise in the United States. Indeed it has become one of the objects of our fascination but, as with the weather, everyone talks about it and no one does anything about it. That can be in part because cronyism is difficult to identify and to expose. Often it is not illegal, a fact that gives moral comfort to its practitioners and ensures its continued advance. Most cronies probably don’t see themselves as cronies but merely as savvy business people trying to do good by influencing policy, or as members of an intelligentsia who have a duty to get involved in government. The zero hour of cronyism may have been in 2008 when the financial crisis was so severe that cronyism came into full public view, like a bad family feud normally played out behind closed curtains suddenly erupting in the town square. The depredations of 2008 look like a textbook script of how cronyism works. Failed capitalists did not fail but were given by their powerful friends another chance and they later employed this new chance not only to cement their own positions and to weaken their competitors, but to also cement the positions of the powerful friends who bailed them out. Everything seems to have worked out just fine so long as not too many people asked questions as to how and why it all happened in the way that it did. But our understanding of this phenomenon has only grown since then. Some of the general workings of cronyism were described in the 2012 book Why Nations Fail: The Origins of Power, Prosperity and Poverty by Daron Acemoglu and James Robinson in which the authors differentiate between extractive and inclusive economies. Extractive economies are dominated by cronyism while inclusive economies are closer to a competitive laissez-faire model. There are two potential candidates for extractive elites in Western economies. The first is the banking sector. The wealth of the financial industry gives it enormous lobbying power, including as contributors to American presidential campaigns or to Britain’s ruling parties. By making themselves “too big to fail”, banks ensured that they had to be rescued in 2008. If it is true that banking is “extractive”, no one should be surprised that eight years after the 2008 bailouts, the socialism of Bernie Sanders and the populism of Donald Trump have reached a very ripe and receptive audience of disgruntled voters. On our thesis, the success of these two candidates is a natural result of the decades-old drift from laissez-faire to cronyism. The problem with cronyism is that it is a form of corruption, albeit one that is nebulous and often legal. A very large sum paid to a former or future government official for consulting or lobbying or for a speech may not technically rise to the level of a bribe but it does look like an attempt to capture that individual and to secure his loyalty before he returns to government where he would then be most appreciative towards his financial patrons. Perhaps then we may think of cronyism as a form of corruption that has thrived temporarily in the absence of the laws and regulations needed to fight it. Or perhaps no new laws are needed and instead a more vigorous judiciary is needed to implement existing laws, that is a judiciary whose independence is not already corroded by the spread of cronyism. Among the many watchdog organizations that study corruption around the world, Berlin-based Transparency International (TI) publishes an annual ranking of countries in its Corruption Perceptions Index. In 2015, TI ranked the United States 16th of 167 countries. Except for Canada, Singapore, Australia and New Zealand, all of the countries that ranked ahead of the US were in Western and Northern Europe, with Denmark, Finland and Sweden achieving the top scores. Large emerging countries fared poorly in the index. Brazil now in the throes of an impeachment battle and several corruption scandals ranked 76th. India was also 76th and Mexico was 95th. China was 83rd and Russia 119th. At the bottom were socialist countries and countries beset by war and internal strife. Overall therefore the US score was not as good as those of small relatively homogeneous European nations, but it was far above those of countries with large populations and growing economies. Yet with the vast amounts of money sloshing around the US economy, courtesy of the Federal Reserve’s zero interest rate policy, and given the rise of cronyism for over a decade, it is fair to wonder aloud whether Transparency International is being too kind with its US ranking. In order to answer this question, we try to estimate the size of the crony economy in the US. This is a difficult endeavor because there are few sources that can be helpful in measuring and quantifying cronyism. The Economist gave it a good try by developing a crony-capitalism index in 2014 and by updating it in 2016. In the US, the wealth of billionaires in crony industries adds up to a relatively small percentage of GDP, 2.2% in 2014 and 1.8% in 2016. According to the Economist, this measure of cronyism is a much bigger issue in other countries such as Russia (18% in 2016), Malaysia (13%) and even Singapore (1o.7%). On the other hand, measured in actual dollars, the wealth controlled by crony billionaires in the United States comes to $334 billion and is second only to that of their counterparts in China. This amount is about ten times the amount of crony wealth in more corrupt (per TI’s estimation) countries such as Brazil and others. So, in raw numbers, the US could be by far one of the largest theaters of cronyism in the world. 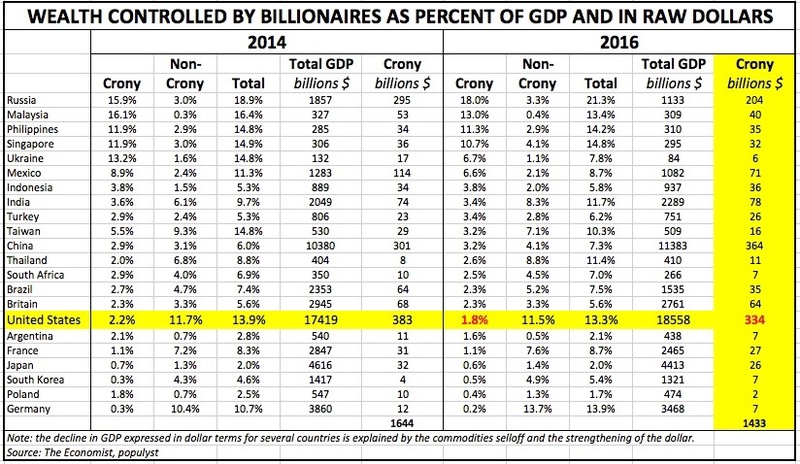 Our newly updated  index shows a steady shrinking of crony billionaire wealth to $1.75 trillion, a fall of 16% since 2014. In rich countries, crony wealth remains steadyish, at about 1.5% of GDP. In the emerging world it has fallen to 4% of GDP, from a peak of 7% in 2008. And the mix of wealth has been shifting away from crony industries and towards cleaner sectors, such as consumer goods. Despite this slowdown, it is too soon to say that the era of cronyism is over—and not just because America could elect as president a billionaire whose dealings in Atlantic City’s casinos and Manhattan’s property jungle earn him the 104th spot on our individual crony ranking. The rich world has lots of billionaires but fewer cronies. Only 14% of billionaire wealth is from rent-heavy industries. Wall Street continues to be controversial in America but its tycoons feature more prominently in populist politicians’ stump speeches than in the billionaire rankings. We classify deposit-taking banking as a crony industry because of its implicit state guarantee, but if we lumped in hedge-fund billionaires and other financiers too, the share of American billionaire wealth from crony industries would rise from 14% to 28%. This lumping together of commercial/retail banks and investment banks/hedge funds under the crony banner would have been largely unjustified before 2008, notwithstanding the controversial rescue of Long Term Capital in 1998, but it does not look as far-fetched after the 2008 bailout of banks of all stripes. After the election, we may see a continued advance of cronyism or we may see a retreat. A trend often turns on itself after it reaches a new apex. In order to dial away from socialism and populism and move back towards laissez-faire, we could step up our efforts to limit and roll back cronyism. Otherwise we may see an even stronger drive towards populism or socialism at the next election. See also The Economist Daily Chart: Comparing Crony Capitalism Around the World. Photo of Hugo Chavez by Victor Soares/AgenciaBrasil via Wikipedia.